Arthur Beaumont ­- I buy Arthur Beaumont watercolors and oil paintings. Arthur Beaumont grew up in England then immigrated to America via Canada when he was nineteen years old. He studied art with Stanton MacDonald-Wright in Los Angeles, William Russell Flint and Frank Brangwyn in London and Jean-Paul Laurens in Paris. In the late 1920s, Arthur Beaumont taught at the Chouinard Art Institute and operated a freelance commercial art business. In the 1930's, Beaumont became a Lieutenant in the United States Naval Reserve and began producing the first of many watercolors depicting battle ships and other naval subjects. 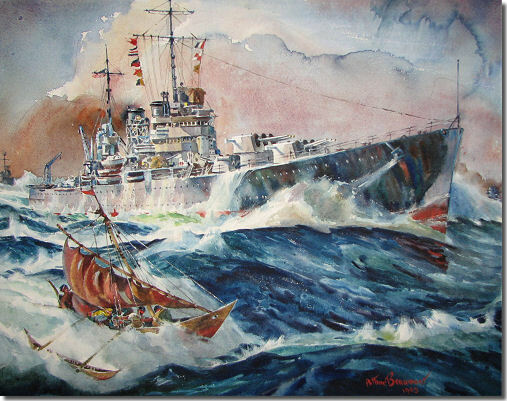 During World War 2, Arthur Beaumont was a war artist, documenting naval battles. A series of these works were published in National Geographic magazine. 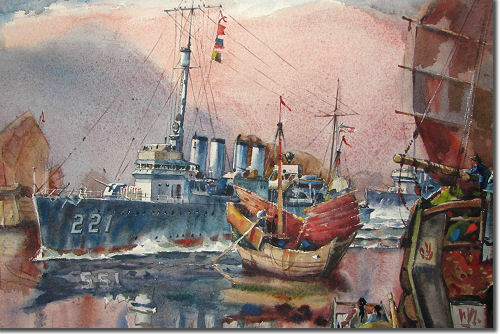 After the war Beaumont continued producing watercolors of naval activities in China, Japan, Guam, Vietnam and the Antarctic. 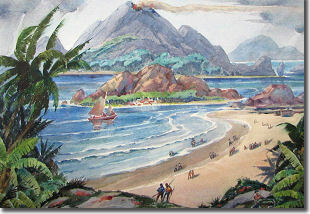 Although he painted depictions of landscape and figurative subjects and worked as a commissioned portrait artist, Arthur Beaumont is best known for his watercolors of ships and harbor scenes. Throughout his career, he exhibited in California on a regular basis. Arthur Beaumont's works were very popular, especially in the 1940s and 1950s, with articles about his works appearing in many newspapers and magazines. In 1989, a book titled Arthur Beaumont, Naval Artist, which documented his life and art, was published in conjunction with a retrospective exhibition at the Laguna Art Museum. Biographical information: Interview with Dorothy Beaumont, 1982. ArthurBeaumont.com is interested in purchasing original oil paintings and watercolors by Arthur Beaumont. If you have a painting by Arthur Beaumont and are interested in selling it or simply wish to obtain an estimated value, please get in touch and we'll provide a free art evaluation. © ArthurBeaumont.com. All rights reserved. No unauthorized use of images or content.